I've attached a screen shot of my game. It is black's turn to move. The king is under check (and not checkmate - as The website didn't showed mate). Finally black had to resign, as he was not able to make any valid move. 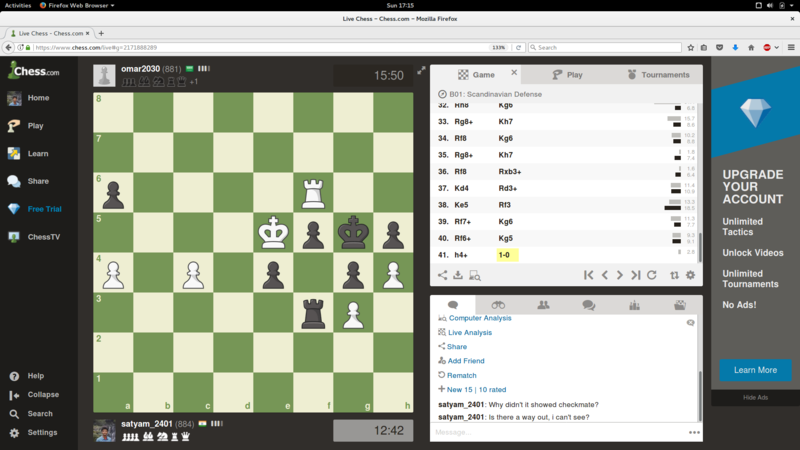 Analyzing the game with a computer results in the move gxh3 being suggested. As White's previous move was pawn on h2 to h4 then pawn g4xh3 is a legal en passant capture. Not the answer you're looking for? Browse other questions tagged checkmate pawns en-passant or ask your own question. How is this checkmate … or does chess.com have a bug?